Fishermen along Costa Rica’s Pacific coastline are reporting an increase in tuna schools and dolphin pods. Fishermen and tourism operators have reported an increase in sightings of tuna shoals along Costa Rica’s Pacific coast in recent months, according to the Costa Rican Fisheries Federation (FECOP), a sport fishing and environmental interest group. The increase in tuna has benefited local, commercial fishing and sport fishing in the region, and has had a positive impact on the number of dolphin in the area, the group said. 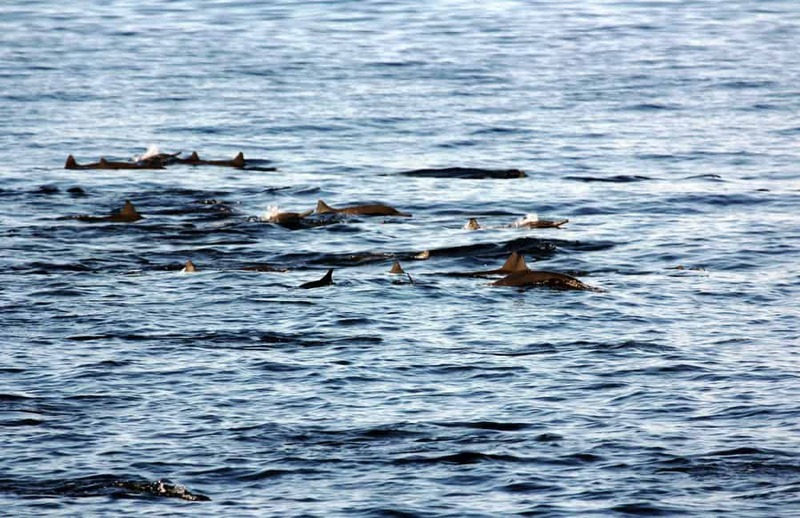 Currently, dolphin “can be seen in the thousands,” FECOP said in a recent report. The group credited an October 2014 governmental decree restricting industrial tuna fishing in Costa Rican waters with what it said were recovering tuna and dolphin populations. Pods of dolphin often travel with schools of tuna, and industrial tuna boats frequently snare dolphin when they cast their nets. The decree, which was supported by FECOP and Costa Rican commercial fishermen, banned industrial tuna vessels from fishing within an area up to 40 miles from the coastline. According to a 10-year study from FECOP, foreign-owned purse seine ships captured 90 percent of the tuna caught in Costa Rican waters between 2002 and 2011. Now only small- and medium-scale longline fishing vessels are authorized to operate within these areas. The law also requires large vessels to use satellite-tracking devices in order to allow monitoring of their position and verification of their compliance with the fishing exclusion areas. Mauricio González Gutiérrez, executive director of the National Chamber of Longline Fishermen, supported FECOP’s report, saying many of the chamber’s associates have seen an improvement in fish populations following the signing of the decree. González said that they have received reports of monthly catches ranging from 100 and 140 tuna over the past year. They have also gotten reports of larger tuna caught. “We started seeing an improvement in medium-size tuna that usually ranged from 26-29 kilos. Then in April we started getting reports of tuna up to 34 kilos,” he said. González noted that fishing exclusion areas also help local fishermen and women work closer to the coastline, which helps them reduce the time spent on the open sea, saving them money in fuel and other supplies. FECOP’s report states that the spike in tuna schools is also having a direct impact on the tourism industry, as more tourists are choosing to go sport fishing and dolphin watching. These visitors also stay at local hotels, hire local transport services, rent boats and spend on food and entertainment, the report states. Marco Quesada, executive director of Conservation International Costa Rica, said his group is cautious about these reports, saying they must be carefully analyzed. Quesada noted that the increase in sightings could be the result of a variety of situations, such as a decrease in fishing in neighboring countries.